This past semester has been a busy one for the Ain Center! From competitions to community workshops, we have expanded our offerings and enjoyed every minute. Read more about our favorite moments from Spring 2018 here. 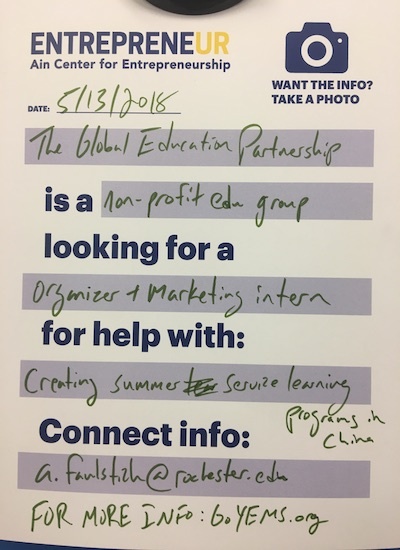 To build upon our busy Fall semester, the Ain Center launched a variety new programs and hosted a number of entrepreneurial events during Spring 2018. Below is just an overview of the competitions, talks, and entrepreneurial projects that happened this semester! 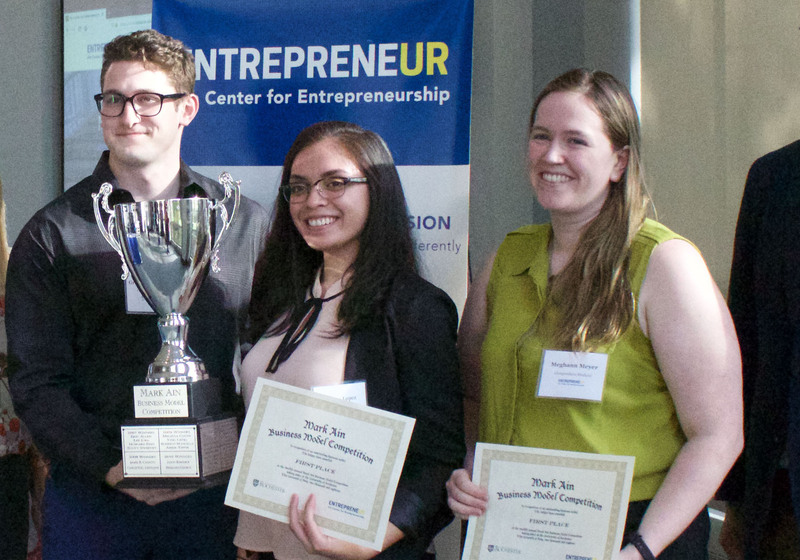 Throughout this spring, the Ain Center offered three competitions to entrepreneurial students. 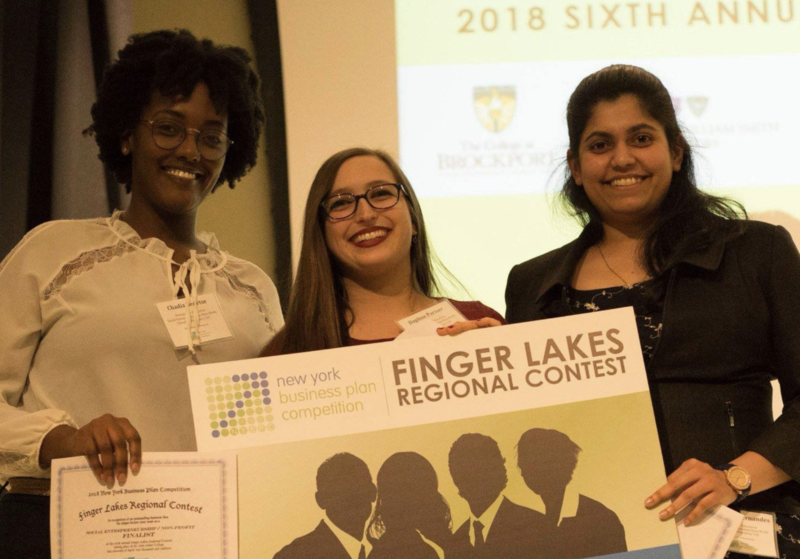 The first, held in April, was the New York Business Plan Competition – Finger Lakes Regional Contest at St. John Fisher College. Teams from six local colleges participated. 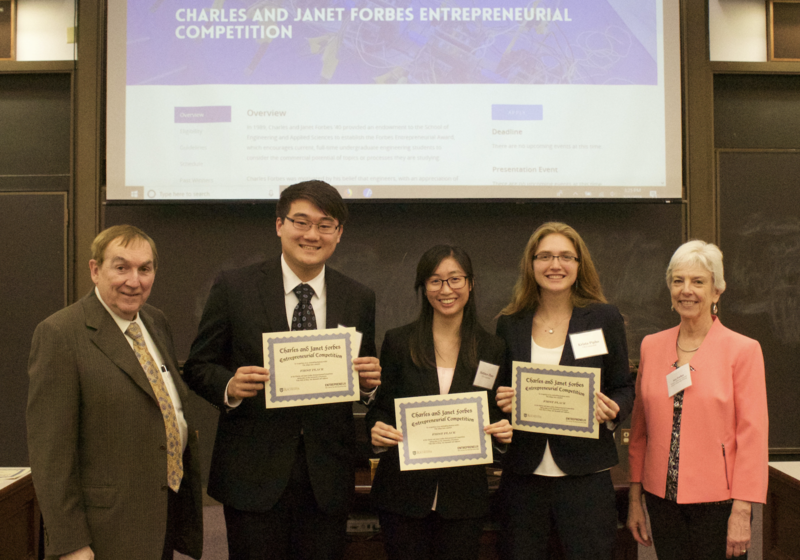 Three U of R teams won their category – Humans for Education in Social Entrepreneurship & Nonprofit, Pollinate in Services, and Solid Cell in Clean Technology; they went on to compete in the statewide finals in Albany. 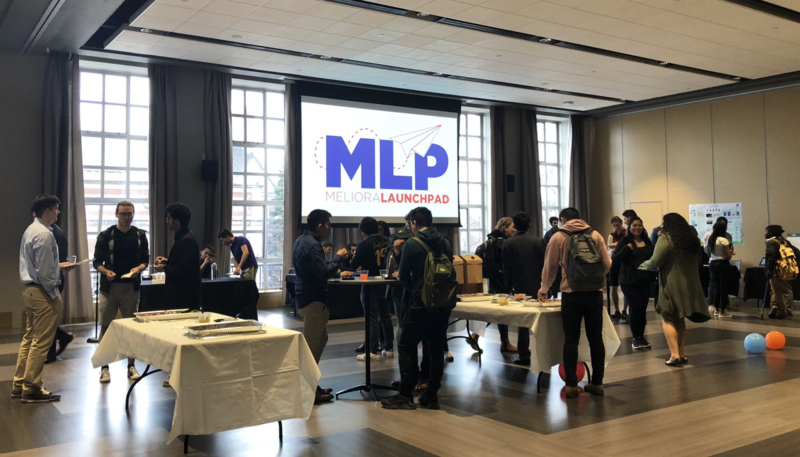 Meliora LaunchPad, one of the University’s student entrepreneurship clubs, hosted an Entrepreneurship Expo at the beginning of May. Only about a year and half old, the club created a fantastic event to highlight student innovators and to celebrate their graduating seniors. 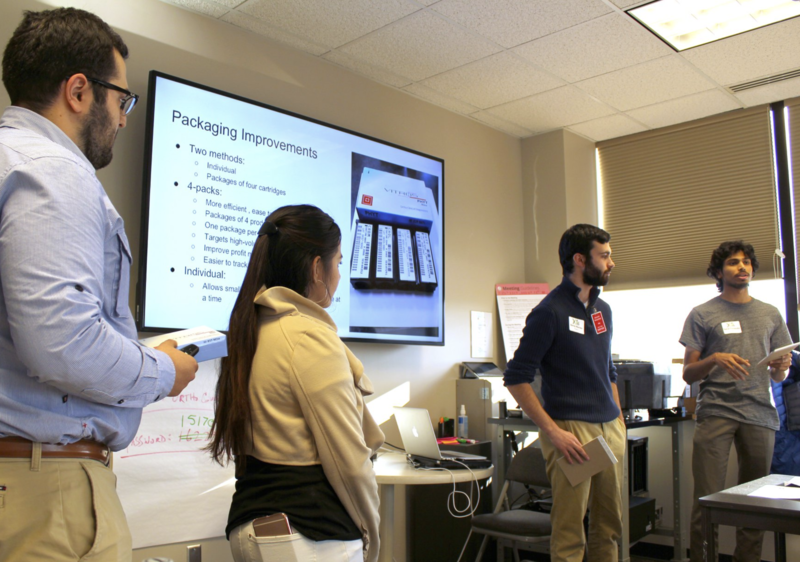 In February, we also co-hosted Club Rochester with other interdisciplinary groups on campus, including the Rochester Center for Community Leadership, iZone, and the Gwen M. Greene Career & Internship Center. One of the University of Rochester’s defining aspects is its commitment to medical discovery and healing. Because the field of medicine is ever-changing (and at the U of R, becoming ever better), the Ain Center and the School of Nursing hosted Dr. Mattia Gilmartin of New York University. Dr. Gilmartin, a former health clinician and current faculty member, spoke to innovators from throughout UR. She shared her perspective as a practitioner, intrapreneur, and educator, with her talk zeroing in on the importance of taking risks and building on your experiences to create something worthwhile. In addition to the formal competitions and lectures, we also hosted smaller, more granular workshops and events, which allowed all members of the UR community to grow their entrepreneurial skillset and mingle with experienced entrepreneurs in fields outside of their own. 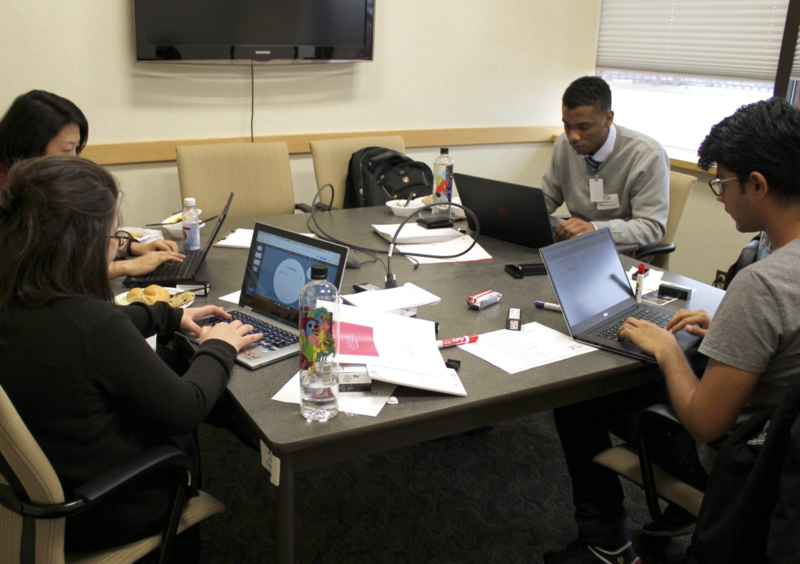 In March, we shuttled students to NextCorps at Sibley Square, where our Incubator is located. 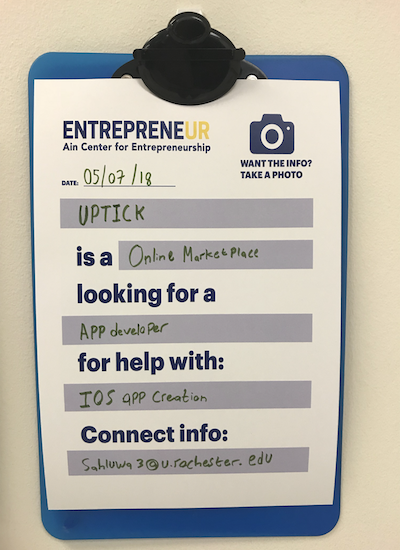 Students were able to network with real startups and see the new space for the first time. We also started a number of online or indirect modes of collaboration. 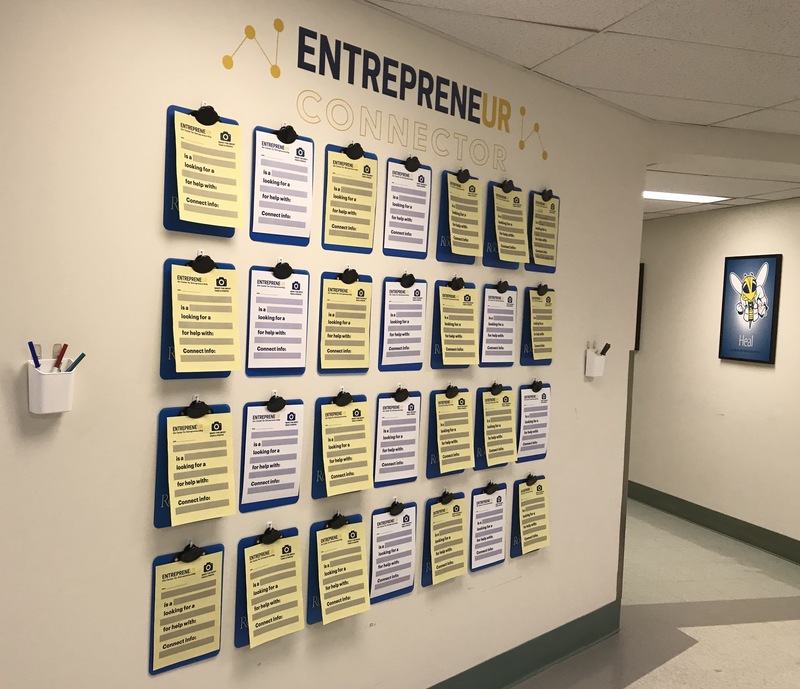 In March, we debuted our Entrepreneur Connector – a physical wall outside the Ain Center filled with postings for teamwork opportunities (students can submit in person or online). 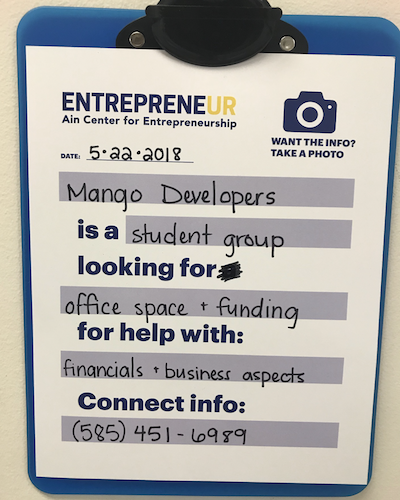 In May, the Ain Center became an admin in the newly launched Entrepreneurship and Innovation Group on The Meliora Collective, a platform for the UR community. 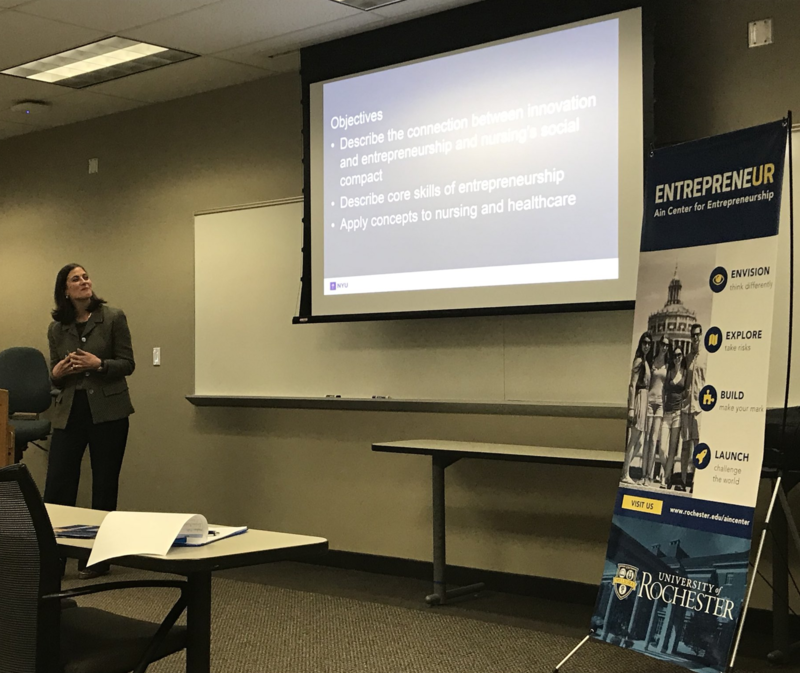 Designed for entrepreneurs, small business owners, and aspiring small business owners in the greater Rochester area, the Buzz Lab Boot Camp held its inaugural sessions this February. 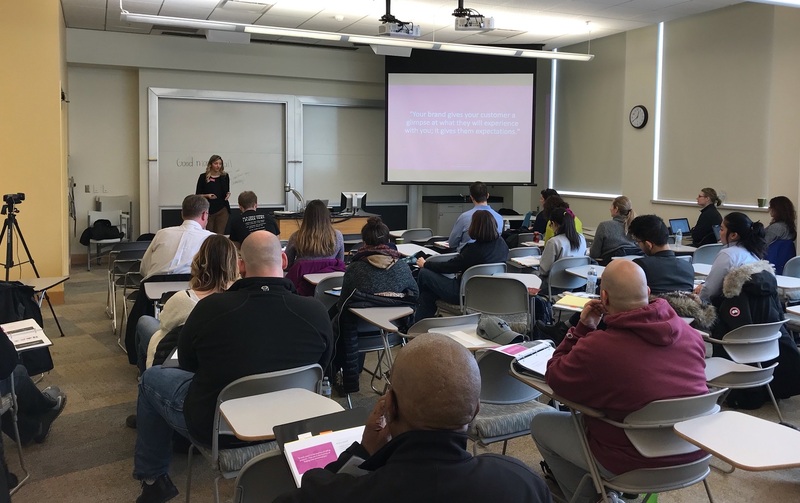 For four Saturdays, participants from the region gathered on River Campus to learn about a variety of topics – including Pricing, Marketing, and Human Resources Management. The wildly successful program was supported by a grant from the Economic Development Administration and is likely to run again next spring! As the semester comes to a close, want to thank all of our wonderful partners and participants. This spring has inspired us to provide more opportunities for our students, build new relationships University-wide, and establish deeper roots in the Rochester community. Keep up with our summer planning and adventures on our social media channels – we’ll be back with more stories in the fall! Each fall, the Ain Center welcomes visiting faculty from Romania to explore entrepreneurship. 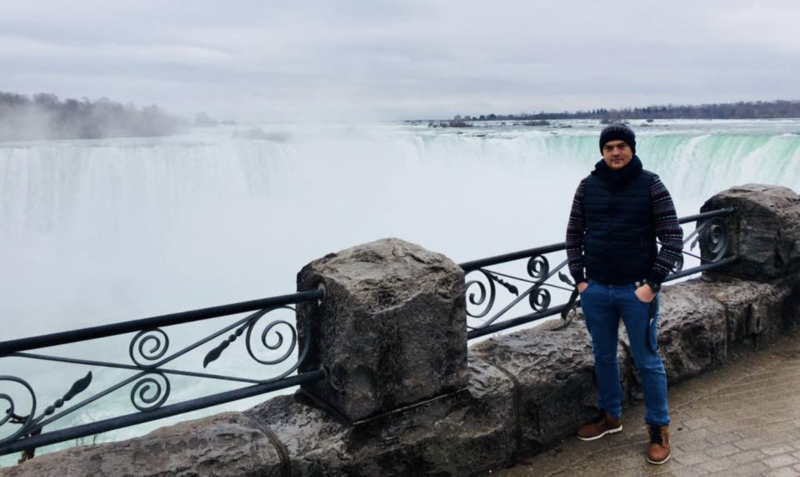 Vladimir Tanasiev, a member of the 2017 cohort, explains how his time at the University of Rochester inspired new ideas and fruitful partnerships. Via the Fulbright-RAF Scholar Award program, I had the opportunity, together with another five Romanian professors, to study Entrepreneurship at the University of Rochester. Although is difficult to sum up my whole experience, I will try to convey the essence of it. Entrepreneurial culture in the United States is growing and channeled around universities, with the support of the entrepreneurship centers. I have clearly understood that there are numerous possibilities to support entrepreneurship and it takes time to get the best results – success doesn’t come overnight. I noticed that USA universities make considerable efforts – both human and financial – to help students think in terms of entrepreneurship, playing in this respect a crucial role in developing the entrepreneurship culture. This continuous effort is strengthened through countless events dedicated to technical, transversal and social topics, contests, debates with investors, etc. 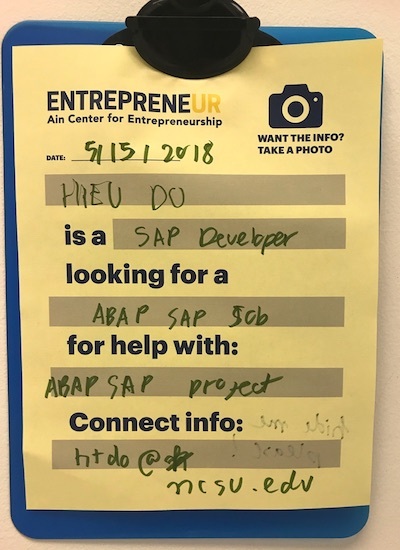 The atmosphere created at the university, around students not only helps them to use their imagination, but also offers them the support for turning their ideas into products or services with economic potential. Life on campus is also quite different from my experience back home. 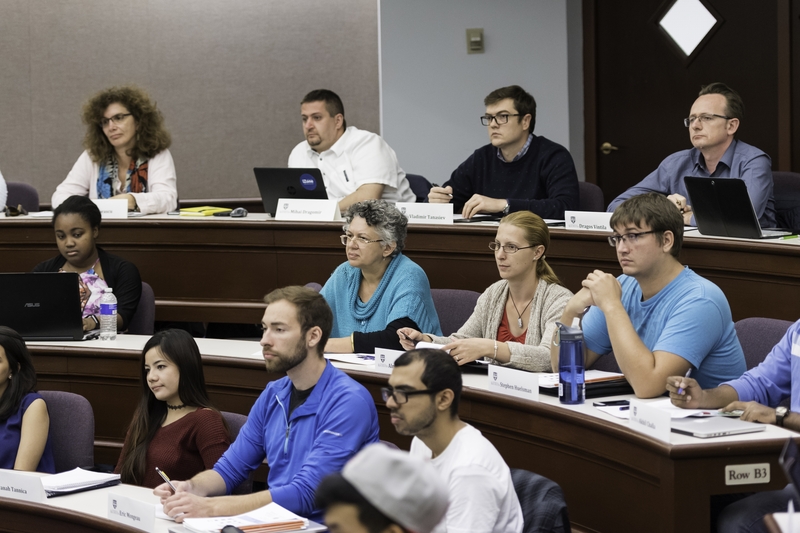 During the whole semester, the students are involved, alongside the theoretical and practical classes, in activities aimed at personal and professional development and networking. One question I have come across quite often was “Can entrepreneurship be taught?”. And the answer is yes, it can be taught, but it’s difficult to measure its impact. An entrepreneur can follow this path only when he feels prepared and this decision can take time. I have also learned that many of the success stories are paved with the determination of those who faced several failures before. To understand the entrepreneurial ecosystem built around the university is one aspect of the problem, but in order to understand its mission and ways to develop, you need guidance. I will take this opportunity to express my sincere gratitude to my mentors, Dennis Kessler and Duncan Moore, who helped me understand how entrepreneurship is cultivated and how it could be institutionalized. Furthermore, whether I was talking to a salesman at the weekly fair or to a university professor, I could always notice the kindness of the people. I had the same feeling when I was talking to colleagues from other universities and many others. During my whole stay I met nice and hospitable people, interested in our culture and open to future collaborations. Additionally, I really enjoyed meeting members of the Romanian community from Rochester who helped me and my colleagues adapt smoothly from the very start. During my professional or leisure trips, I had the opportunity to discover the beauty of the USA, equally present in large cities, small towns and its national parks. These trips offered my colleagues – Dragos Vintila, Mihai Dragomir, Anca Nicolau, Corina Forascu, Alma Pentescu – and myself the context to get to know each other better, to become friends and to work together on future plans. Vladimir Tanasiev was one of six Romanian professors in 2017 to receive a Fulbright-RAF research grant to learn about entrepreneurship at the University of Rochester. Tanasiev is an Assistant Professor within the faculty of Power Engineering at the University Politehnica of Bucharest, Romania. His Fulbright-RAF experience allowed him to develop an action plan to insert entrepreneurship into his projects, as well as to reflect on how he can help entrepreneurship flourish in Romania.